There are so many different ways to improve so many different kids. Footwork and vision, power and precision, movement and decision, belief and repetition, challenge and intuition. We all have eyes, ears, mouths and minds. We just need to open them. We need to look, listen, ask questions and learn. Think outside the Goal Square. Kids are easy to improve because they're willing to listen and learn. 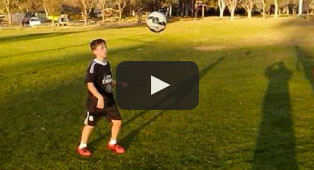 We can improve any soccer kid in 5 minutes just by using the 10 freestyle elements. 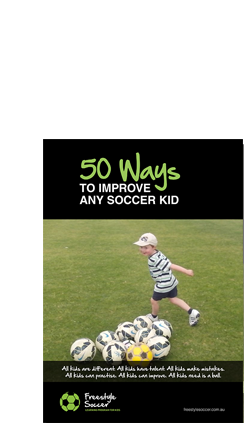 Freestyle Soccer: 50 Ways to Improve Any Kid! Ordinary kids are predictable and only train because they have to. Freestyle kids are unpredictable and train because they want to. Understanding the game is the first half. Understanding kids is the second half. We should be aiming for Top 20 in the Football World. Close repetition drills are designed so that the training effects are immediate, visible, permanent and measurable. • Ordinary training produces ordinary players. • Extra training produces extraordinary players. • A one footed player doesn’t have a leg to stand on. • How good you are depends on how bad you want it. Natural skills: When Soccer kids kick a ball, look at their eyes. When they head the ball, look at their feet. We spend so much time teaching kids what to do with the ball that we never learn what they do without the ball. All kids need is a ball. Freestyle Soccer is a whole new ball game! Jack Kynaston's FREESTYLE SOCCER website is live. FreestyleSoccer updated their cover photo. There are thousands of Australian kids who practice new skills every day without any supervision or correction by well-meaning adults.MORE.. 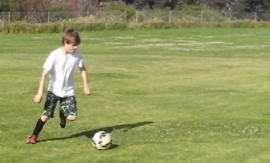 If we teach Soccer kids everything we know, we can develop their technical skills. If we learn everything we don’t know about Soccer kids, we can discover and develop their natural skills.MORE..
Footwork and vision, power and precision, movement and decision, belief and repetition, challenge and intuition.MORE.. Think outside the Goal Square.MORE..
Juggling has got nothing to do with playing soccer MORE.. Ordinary training produces ordinary players. Extra training produces extraordinary players. A one footed player doesn’t have a leg to stand on. Near Post, Far Post, Left Wing, Right Wing, Cut it, Back, Penalty SpotMORE..